In this months Empire Magazine actor Jeremy Renner revealed that Marvel Studios is looking for an actor to appear in Thor, as Clint Barton aka Hawkeye to serve as a teaser for the upcoming 'Avengers' movie. "Hawkeye could be interesting," he told them. "They're going to send me some stuff on it, see what it is, but I think they're pretty awesome, trying to make superhero movies almost plausible and not just some fantasy thing." UPDATE: In a interview with superherohype, Jeremy Renner further elaborated on his chat with Marvel and ideas for Hawkeye. I haven’t heard anything since I talked to them three weeks ago. The last I knew is that they still have to find their director for ‘The Avengers,’ that’s where he’s really going to show up. 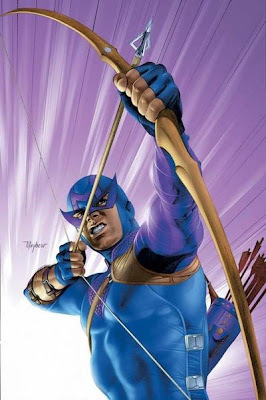 They were just talking, ‘Like maybe we should consider maybe hiring Hawkeye now’ but there’s no director on ‘Avengers’ so they don’t really want to force-feed the director, ‘Here’s the whole cast.’ It’s a big role so they didn’t want to do that to the director, so I think they might wait. I know they’re interested, I’m interested, so we’ll see if it works out. They sold me on the idea, too, because I love the idea that Hawkeye’s really not a superhero. He’s just a man with a high skill set, so I can relate to (that). The Marvel guys are great for how they made Iron Man to be, ‘Oh, that’s actually plausible’ so I bought it and I love that. They’re really, really smart guys and I’d love to work for ‘em, and we’ll see if it works out. It’s going to be modernized, it’s not going to be the guy with the big purple (mask), it’s not going to be a guy in tights. It’s going to be a guy in sunglasses and a vest. He’s going to be more modernized and I’m gonna say, ‘A cooler-looking version’ and not the big weird costume he had on. I don’t think they’re going that route.